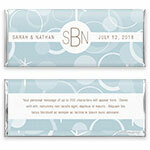 Mod style is the name of the game with this fun and stylish wrapper design. Design: Retro circles and stars background with a monogram. Personalization: Front initials, names and date with back message.